To be used with: Original DIY air purifier (Black fan). CE 2047 according to PED (97/23/EC). Certified by Regal Quality Registrars, Inc, UK. Made in India with imported HEPA material. HEPA filters (or High-efficiency particulate air) are filters that capture at least 95% of particles. The ones we use capture 99.95% of all particles, including the really tiny ones. Since HEPA filters get the really small particles, they can capture a lot of the harmful stuff. How often should I change the HEPA filter? We recommend replacing your filter after 140 days of use at 8 hours a day at the latest. That’s maximum 1000 hours in total. We ship replacement HEPAs starting at 1300 rupees from our store. Why 140 days? 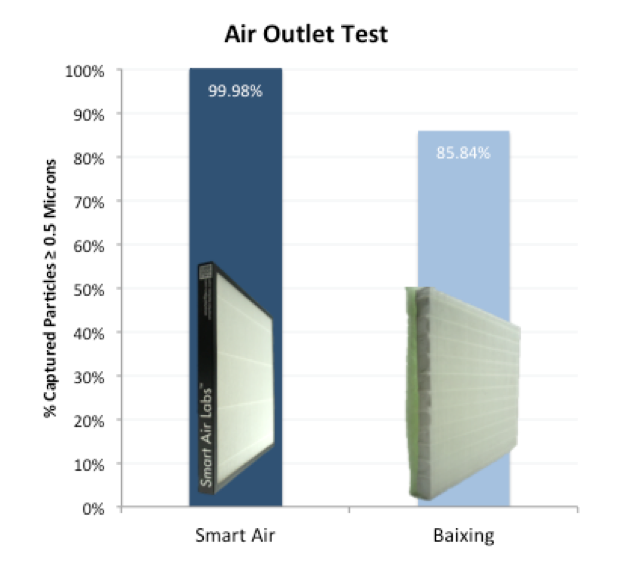 Smart Air co-founder Gus tested a single HEPA on his Original DIY for 200 days to see how long it would last in real Beijing air. After 100 days of use at 8 hours a day, effectiveness dropped 4%. After 200 days of testing, Gus’s dirty filter was only removing half the particles in the room. This test was done in Beijing. Indian air and Delhi’s, in particular, is about twice as bad as Beijing’s so filters won’t last as long in these higher pollution levels. We recommend changing your filter after 720 hours You can use this number to calculate how often you need to change your filter based on how often you have your purifier running. For example, if you keep your purifier on 12 hours a day, we’d recommend replacing your filter after 60 days. We know that buying new HEPA filters is a significant recurring cost, so we do our best to keep prices low. Can you make HEPAs even cheaper? We tested a Rs.300 filter from China and compared it to our own filters. We found the difference in effectiveness to be severe so we recommend avoiding unknown HEPA filters that appear too good to be true. Read more about the tests we did with a cheap HEPA on our blog. Can I wash my HEPA filter? We tested this in our labs, we tried washing, vacuuming and scrubbing a HEPA filter to find out if there was a cheaper way of making your filter last longer. Turns out none of these methods were effective in increasing the lifespan of a HEPA filter, so we still recommend replacing them when their time is up.